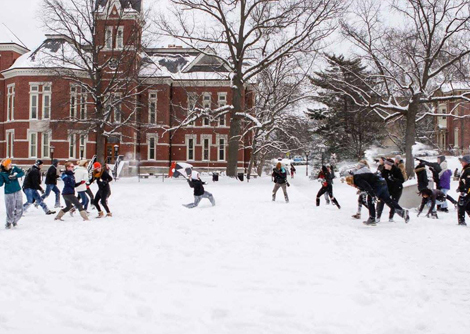 Students throw snowballs on the Francis Quadrangle during Monday's snow day. Photo by Tanzi Propst. Over the past several years, February has been the month of heavy snowfall and MU snow days. Monday’s closing was the campus’s eighth full snow day in February since 2011. That year, the campus closed Feb. 1–3, when the white stuff at Sanborn Field measured 14.5 inches. In 2013, MU shut down at 1 p.m. Feb. 21 and all day Feb. 22 and 26. Last year, the university closed Feb. 4–5 with an accumulation of 9 inches of snow. Weather-related class cancellations also happened Dec. 1, 2006; Jan. 12, 1998; Jan. 19, 1995; Feb. 13, 1978; and 1949 (date unavailable), according to Missouri Alumnus and Savitar reports.